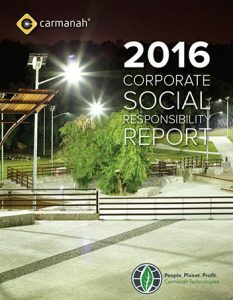 We are pleased to share our third annual Corporate Social Responsibility (CSR) report, which summarizes our triple bottom line performance for our 2017 fiscal year. The bulk of the information in this report is limited to our Victoria, Canada, office. This year, we also reached the next layer of our Circle of Influence, which involved reviewing our manufacturing procedures. In future years, we hope to also report on our subsidiary offices and supply chain. 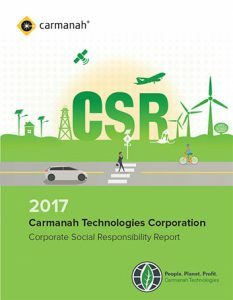 In 2015, Carmanah began publishing an annual Corporate Social Responsibility Report, in which we proudly set goals and report on our corporate triple bottom line activities. Our triple bottom line commitment means doing business in a manner that supports people, planet, and profit. We are committed to minimizing the environmental impact of our operations and supporting the health, wellbeing, and education of our employees and the people in the communities we interact with and serve. We believe that these activities will benefit both the environment and society while simultaneously enhancing our corporate profitability and value. We have seen progress within many of our initiatives, including reducing carbon emissions, maintaining a zero-waste office, and more. We will continue to develop initiatives that will reduce the environmental impact of our company and increase the social and community well-being of our stakeholders.